CAPS Power Systems Research Group. Photo credit: Bill Lax/Florida State University. 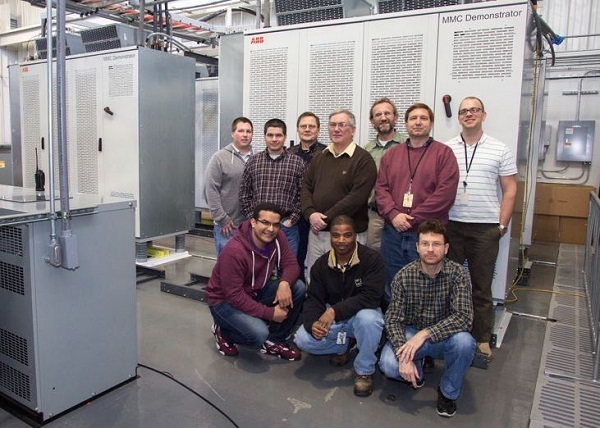 Florida State University’s Center for Advanced Power Systems (CAPS) has unveiled a new 24,000-volt direct current power test system, claiming it is the most powerful of its kind available at a university research centre in the world. With a capacity of 5MW, the new system will give CAPS the ability to test electrical equipment in real-world conditions, says FSU, and companies looking to build next-generation power equipment will be able to test those in the Tallahassee-based facility. To create the system, CAPS put together four individual 6kV, 1.25MW converters that can be arranged in any combination—in series or parallel—to form a flexible test bed for medium-voltage direct current (MVDC) system investigations. The MVDC system was built by ABB Inc. based on CAPS’ specs. “This is the first time anyone has strung together four individual converters of this magnitude and operated them in a safe and controlled manner,” said Michael Steurer, senior research faculty and leader of the Power Systems Research Group at CAPS. University of British Columbia physicists have detected ‘charge ordering’ in electron-doped cuprate superconductors for the first time, according to research published today in Science. Charge ordering is a ripple-like instability at the electron level that competes with superconductivity and likely suppresses the temperature at which materials demonstrate superconducting properties. Until now, researchers had only observed the phenomenon in other forms of cuprate materials. 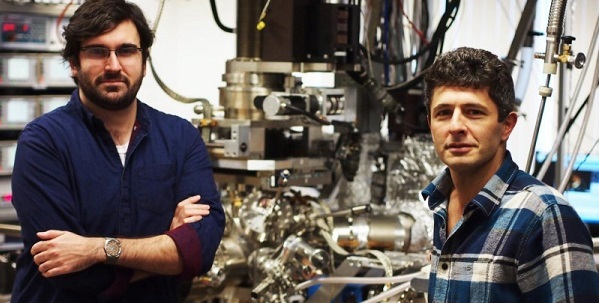 This image depicts Eduardo H. da Silva Neto and Andrea Damascelli at UBC’s Quantum Matter Institute. Credit: University of British Columbia. “The universality of charge ordering across these very different materials shifts our perspective, and could propel future breakthroughs,” says Eduardo H. da Silva Neto with UBC’s Quantum Matter Institute and the Max-Planck-UBC Centre for Quantum Materials, who led the experiment with researcher Riccardo Comin. “We need to understand how charge ordering is formed in materials and ideally tune it, allowing superconductivity to occur at temperatures closer to room temperature,” adds da Silva Neto, who is a Canadian Institute for Advanced Research postdoctoral fellow at UBC. Doping involves adding impurities (electrons or ‘holes’) into materials in order to spur the material to exhibit unusual behaviours such as high-temperature superconductivity. Recent superconductivity research on charge ordering in hole-doped cuprates has focused on understanding its connection to another mysterious state: the pseudogap. Most experiments suggest that the pseudogap is a necessary ingredient to charge ordering, and consequently the suppression of superconducting properties. But the UBC research indicates that the pseudogap is not a prerequisite for charge ordering in electron-doped materials. Superconductivity — the phenomenon of electricity flowing with no resistance — occurs in some materials at very low temperatures. High-temperature cuprate superconductors are capable of conducting electricity without resistance at record temperatures, higher than the boiling point of liquid nitrogen. Because of their unrivalled characteristics, they represent the best candidates to advance current superconductor technology, which includes a broad range of applications such as: quantum computers, MRI, high-precision magnetometry, levitating high-speed trains, and lossless power lines.